Comments: These gregarious hawks can often be found feeding and migrating in flocks that may total more than a thousand birds. 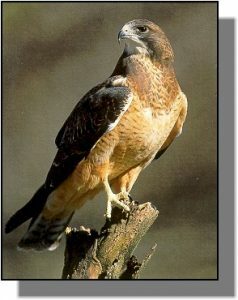 There are no recognized subspecies of Swainson’s hawks, but they can be light, rufous or dark morph birds. On lighter colored birds a dark brown bib can be seen between a lighter colored chin and belly. When seen in flight the leading edge of the wing is light, and the flight feathers are dark. Juveniles have a streaked plumage. Distribution: Swainson’s hawks breed from southwestern Canada through central and western United States to the northern parts of Mexico. A large majority of the birds winter in the pampas of Argentina. For the birds that breed in Canada and winter in Argentina that means traveling over 6,000 miles, a trip that may take nearly 2 months to complete. Populations have been reduced since the early 1900s due to loss of habitat and declining prey populations as a direct result of pesticide application to insects in agricultural crops. Food: Non-breeding birds eat mostly large insects. Grasshoppers seem to be a favorite. They are often seen foraging in fields where farm machinery disturbs their prey. During the breeding season Swainson’s hawks eat a more typical hawk diet of rodents, rabbits, ground squirrels, birds and reptiles.